Five of Pentacles isn’t a very positive card, because it warns that any undertaking, whether good or bad, will likely to lead to a very undesirable result. 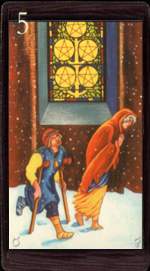 If this card happens to appear when practicing divination on a person’s character, the Five of Pentacles has a quite controversial meaning, it indicates that a person is inventive and not stupid, but he doesn’t have much luck, as most of his undertakings don’t end quite the way he wanted. Such behavior often causes misunderstanding and even mistrust within the society. If this card happens to appear when practicing divination on a specific situation, the Five of Pentacles portends troubles. You should be is very sensitive to dubious offers and be less adventurous. In relation to the Major Arcana, this card has a bad value – it enhances the bad influences of the negative Major Arcana cards and decreases the good ones. Loss of something material and a purchase of everyday experience, learning a lesson. It’s a symbol of a collapse of the balanced Four cards, which may manifest in a form of anarchism, a collision of group interests. In a spread, it usually means complexity, difficulty, which either leads you to success and approval at the next level, or pounding back to the level of Four cards. Overspending of energies, waste of reserves, vulnerability and fear. Reversed Five of Pentacles indicates that you’ve been going on the wrong way. This card symbolizes disharmony in romantic relationships. The card can also indicate stagnation in affairs, mundane concerns, dissatisfaction. Perhaps you see great opportunities for yourself, but they are still not quite within a reach. The ultimate goal is visible, but at the moment is not achievable.